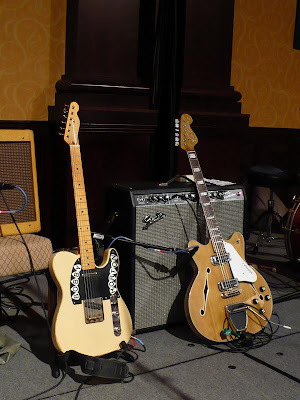 Here's a cool pic of my guitar next to Jimmie Vaughan's. That's a Fender Coronado Wildwood II from the late 60's. He actually uses flatwounds on this one and it sounds great. I also got to noodle around on his sunburst Strat during rehearsal and was surprised that the action is about as high as mine. I like mine high so I can "dig in" when I thumbpick. Bear and the Essentials "Two Time Fool"